James O'Keefe, founder and president of Project Veritas, speaks at the National Conference on the First Amendment at Duquesne University. 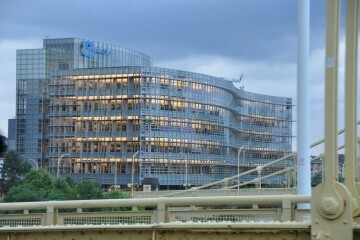 Photo courtesy of Duquesne University. That bit of criticism felt a little ironic coming from someone who often holds unwitting interview subjects to almost impossibly high standards with his own questions. 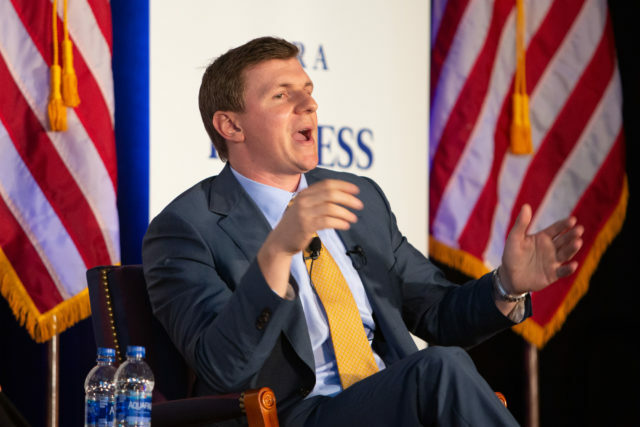 O’Keefe calls himself an investigative reporter, and he runs Project Veritas, a nonprofit that typically sends undercover reporters to surreptitiously videotape people who think they are talking in private. This unconventional strategy sometimes catches people — such as politicians, bureaucrats, campaign workers and nonprofit staffers — making comments they never would otherwise admit to a reporter or say in public. O’Keefe defends the practice as the best way to learn someone’s true feelings. He points, with accuracy, to a rich tradition of journalists posing as something other than themselves during an investigation. 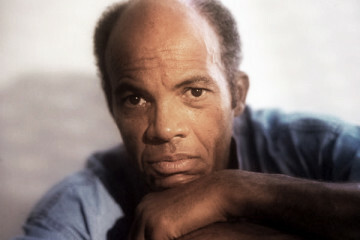 Pittsburgh-area native Nellie Bly once entered an insane asylum in 1887 as a patient to reveal the deplorable conditions inside, and Post-Gazette reporter Ray Sprigle posed as a black man in 1948 as he traveled through the South for 30 days. The panel “First Amendment on the Edge: New, Controversial and Outlier Approaches” featured moderator Andrew Conte with national political writer Salena Zito and James O’Keefe. Photo courtesy of Duquesne University. 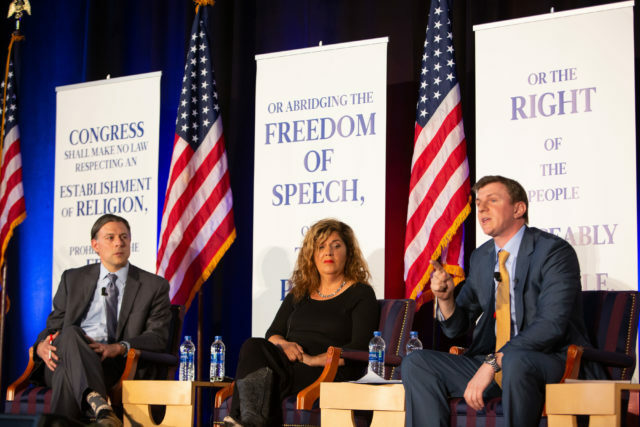 O’Keefe and I spoke at the National Conference on the First Amendment held at Duquesne University in Pittsburgh, when I moderated a panel with him and national politics writer Salena Zito. From the start, O’Keefe came out swinging. He identifies himself as a journalist, but immediately attacked traditional journalism. Before we went on stage, O’Keefe said he wanted four to five minutes to answer my first question about his methodology. The organizers of the event had asked me to share some questions with the panelists in advance. O’Keefe ignored the opening question about his methods and instead started a polemic against traditional journalism. Leaving little space for fellow panelist Zito to speak, O’Keefe defended his practices and objected to his critics. O’Keefe and Project Veritas do capture revealing moments on video. His latest work focuses on Democratic Senate candidates such as Missouri Sen. Claire McCaskill and North Dakota Sen. Heidi Heitkamp. Several close races will determine which national party controls the Senate. In one video, McCaskill talks into a hidden camera saying she would vote for gun control measures, which she has done, such as banning bump stocks and high-capacity ammunition magazines. In that and other videos, campaign staffers talk about how the senators, if re-elected, will be more liberal in office than they say on the stump. 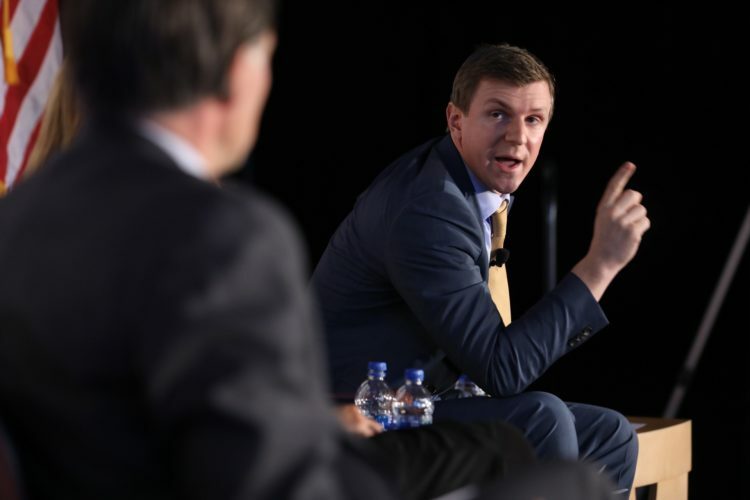 “If there’s no difference between how you project yourself to the world and what you say, you shouldn’t be worried about people like me,” O’Keefe said during the panel discussion. Photo courtesy of Duquesne University. McCaskill has called for her Republican opponent, Missouri’s attorney general, to open a fraud investigation of Project Veritas’s Action Fund. The Kansas City Star has reported that O’Keefe’s group sent an undercover reporter to pose as an intern for McCaskill’s campaign. Project Veritas’s undercover tactics also can be revealing even when they do not play out as designed. Last year during Alabama’s Senate special election, Project Veritas sent an undercover person to The Washington Post who claimed to have been impregnated as a teenager by Republican candidate Roy Moore. The Post, to its credit, insisted on verifying the woman’s story, and in the process, discovered her real affiliation. The newspaper won a Pulitzer, in part based on its reporting of the encounter. In that case, O’Keefe’s subterfuge revealed the Post’s high standards. O’Keefe also draws critics because he chooses targets based on a particular ideology, which seems to come from a conservative, small government perspective. He doesn’t deny that his reporting has bias, but says it doesn’t matter. Here, O’Keefe has a point. Project Veritas makes traditional journalists uncomfortable with his tactics, his political perspective and his brash over-the-top style. But when he reveals legitimate hypocrisy — by politicians, bureaucrats, campaign staffers and others — even the critics have to wonder whether these people should get their stories straight.